Stir oil with lemon juice, lemon zest, oregano, salt, and pepper until combined. Marinated veal for 10 to 15 minutes. Heat oil until hot in a large stainless steel skillet set over high heat. 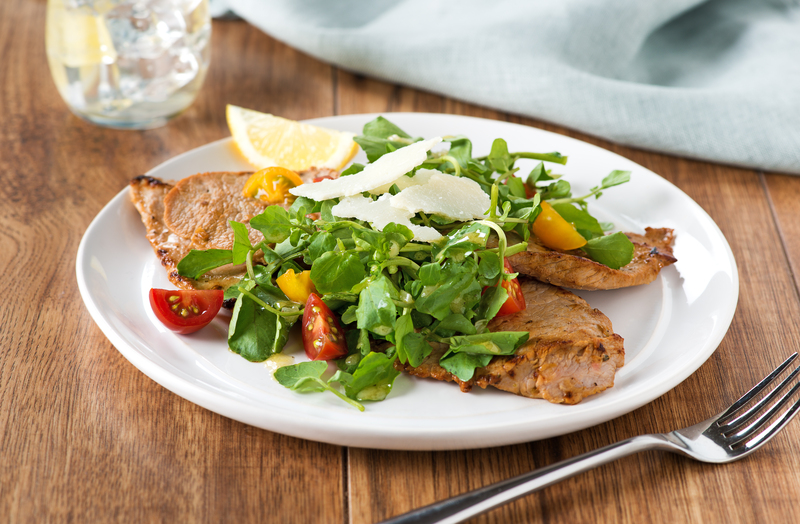 Cook veal in batches, for 2 to 3 minutes per side, or until golden brown and just cooked through. Divide scallopini among 4 plates. Top with Fresh Watercress Salad. Sprinkle with shaved Parmesan cheese. Serve with lemon wedges. Fresh Watercress Salad: Whisk olive oil with lemon juice, shallot, mustard, honey, salt, and pepper until combined. Toss watercress and tomatoes with 3 tbsp vinaigrette. Store remaining dressing in refrigerator for up to 3 days.